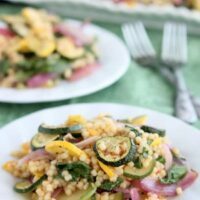 Roasted Vegetable Pasta Salad - Dessert Now, Dinner Later! Y’all! 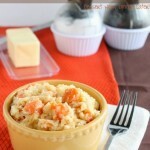 I’m so excited about today’s recipe! It’s so unique to anything I have ever tried. 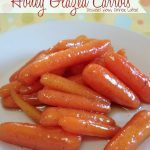 Now, some of you might be tired of summer squash and zucchini, but my plants didn’t harvest until late in the season, so feel free to modify this recipe with some fall veggies like carrots, parsnips, and beets. They will take extra cook time, probably 10 minutes, just cook them until fork tender. 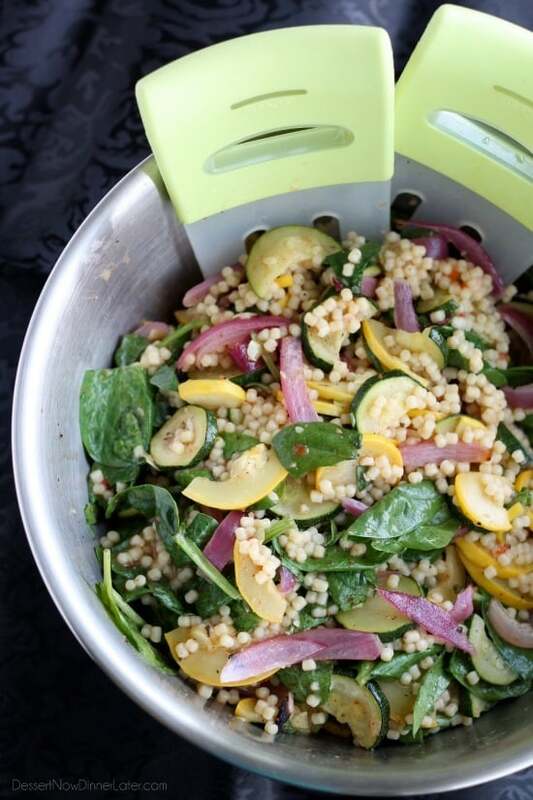 Let me tell you what I love about this Roasted Vegetable Pasta Salad. You can eat it warm or cold, and it’s delicious either way. We ate ours warm after I made it, and then cold as leftovers, you really can’t go wrong! 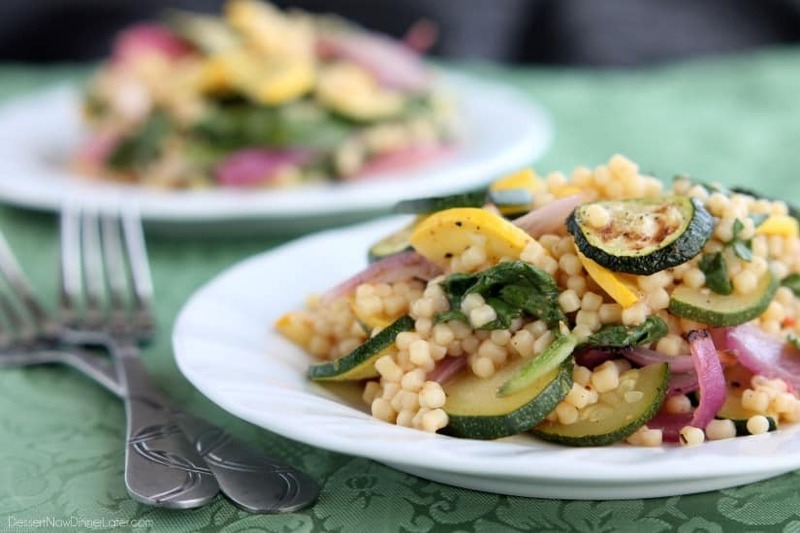 You can eat it as a meatless main dish, or a nutritious side dish. 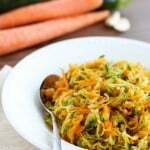 The crunchy vegetables with the tender little pasta rounds (acini di pepe) give it great texture, while the dressing gives it a sweet and rustic flavor. Let me talk about this dressing! 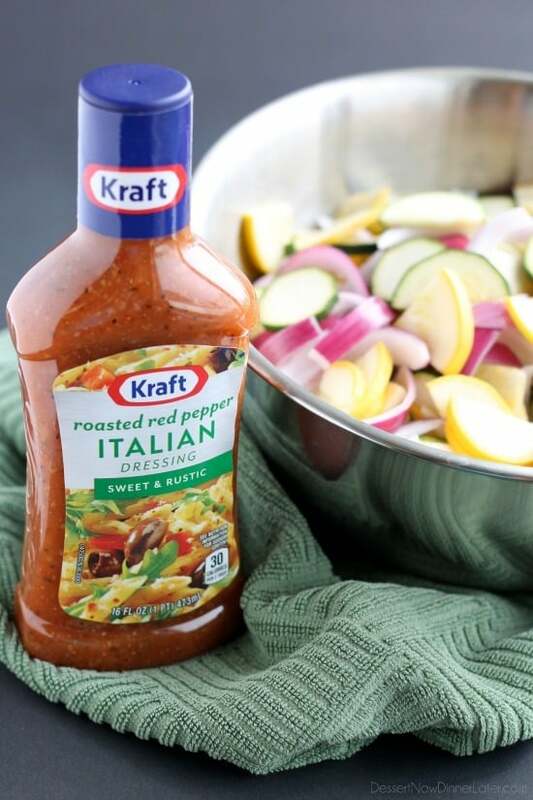 I saw this Roasted Red Pepper Italian dressing from Kraft and knew it would go perfectly with my roasted vegetables. It has great flavor! It’s gently sweet, and has a really slight heat from the pepper. It was fabulous in this dish, and I can honestly tell you that we will be making this dish again and again! It’s especially going to be a summertime staple with our zucchini and squash plants, but I’m excited to use it with some fall veggies too! 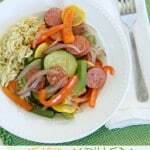 Try this new and nutritious dish for dinner sometime! I’m sure you will like it! 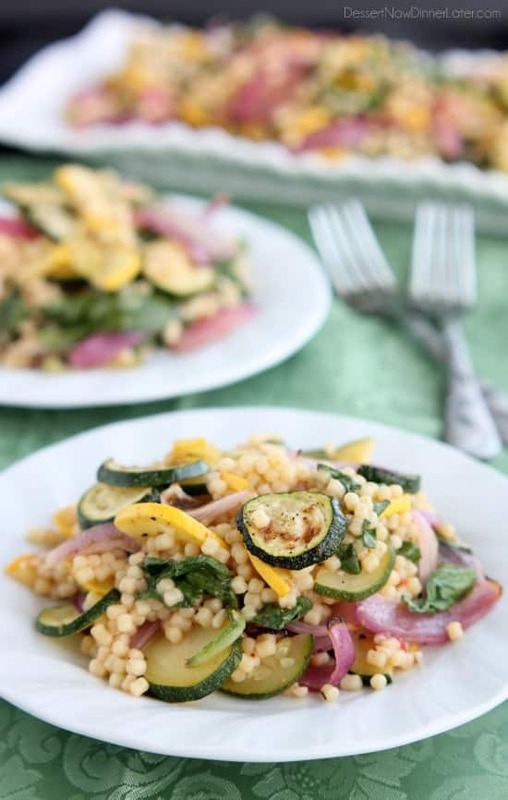 Toss the zucchini, yellow squash, red onion, and garlic in a large bowl with the olive oil. Spread vegetables on a baking sheet, and season with salt and pepper. Bake at 450 degrees Fahrenheit for 8 to 10 minutes. With a hot pad, remove the tray from the oven, move the oven rack up to the top; return the tray back to the oven and switch the heat to broil. Broil for 5 minutes or until lightly golden without over cooking the veggies. Meanwhile, boil some salted water for the acini di pepe. Cook for 10 to 12 minutes or according to the box directions. Drain and place in a LARGE bowl. When the vegetables are done, add them to the bowl with the pasta, add 2 cups of fresh spinach, and 1 cup of Kraft Roasted Red Pepper Italian Dressing. Toss gently. The spinach will wilt slightly with the heat from the pasta and vegetables. Serve warm. Alternately refrigerate and serve cold. Swap out summer veggies with fall root vegetables (carrots, parsnips, beets) and bake for an additional 10 (+) minutes.